There’s lots to be thankful for in Australia, but so caught up are we in the trappings of life, we often forget to be grateful. I was reminded of this at a recent dinner party where I heard about a new, privately funded initiative that hopes not only to readdress this, but raise funds to do good. That sounded like an idea worth throwing money at, I thought. Project Thankful, as it’s called, might be a good first step for people who want to make a difference to their lives and those of others but are unsure of how to do it in a meaningful way. Not only will they be contributing to a global cause – violence against women, in this case – but their exposure to it could help them reflect more positively on their own good fortune. The same could be said about engaging in any philanthropic venture. The problem is finding one that resonates with you. Choosing a charity or social enterprise – or group of them – to donate your time and money to is not simple. Whether you have the means to make a significant impact or not, you still want to feel that whatever you’re providing is going to be put to effective use in a cause that matters to you. Australians don’t have a good track record at being proactive on this front, certainly compared with people in other jurisdictions. Americans and Brits have greater taxation incentives to donate to not-for-profits, which puts philanthropy much more at the front of people’s minds, particularly among wealthy individuals. Giving in the US, for example, has consistently increased since its recent low in 2009, rising 20 per cent since then, according to the latest annual JB Were update comparing giving trends in the US with Australia. Giving levels in Australia have remained flat over the same period. Those with between $50,000 and $1 million in taxable income recorded their lowest giving level since records became available in 2000, the report found. There’s no gratitude in that. 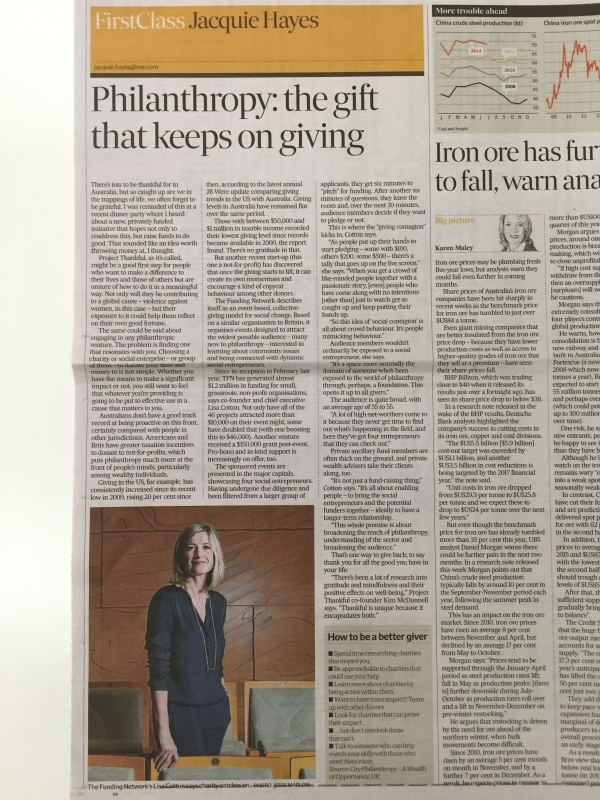 But another recent start-up (this one a not-for-profit) has discovered that once the giving starts to lift, it can create its own momentum and encourage a kind of copycat behaviour among other donors. The Funding Network describes itself as an event-based, collective-giving model for social change. Based on a similar organisation in Britain, it organises events designed to attract the widest possible audience – many new to philanthropy – interested in learning about community issues and being connected with dynamic social entrepreneurs. Since its inception in February last year, TFN has generated almost $1.2 million in funding for small, grassroots, non- profit organisations, says co-founder and chief executive Lisa Cotton. Not only have all of the 46 projects attracted more than $10,000 on their event night, some have doubled that (with one boosting this to $46,000). Another venture received a $150,000 grant post-event. Pro-bono and in-kind support is increasingly on offer, too. The sponsored events are presented in the major capitals, showcasing four social entrepreneurs. Having undergone due diligence and been filtered from a larger group of applicants, they get six minutes to “pitch” for funding. After another six minutes of questions, they leave the room and, over the next 30 minutes, audience members decide if they want to pledge or not. This is where the “giving contagion” kicks in, Cotton says. Audience members wouldn’t ordinarily be exposed to a social entrepreneur, she says. The audience is quite broad, with an average age of 35 to 55. Private ancillary fund members are often thick on the ground, and private wealth advisers take their clients along, too. “It’s not just a fund-raising thing,” Cotton says. “It’s all about enabling people – to bring the social entrepreneurs and the potential funders together – ideally to have a longer-term relationship. That’s one way to give back; to say thank you for all the good you have in your life. Spend time researching charities that inspire you. Be approachable to charities that could use your help. Learn more about charities by being active within them. Want to have more impact? Team up with other donors. Look for charities that can prove their impact . . .
but don’t overlook those that can’t. Talk to someone who can help match your skills with those who need them most.